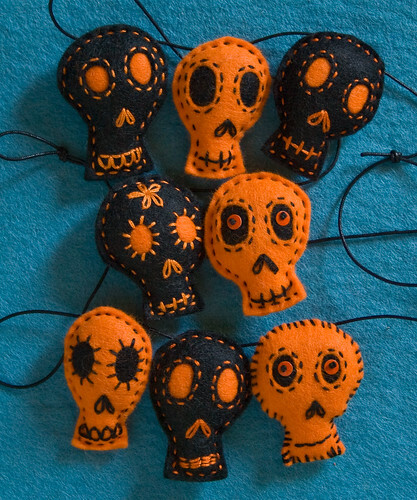 Yup, it's that time of year again, to start dreaming up some Halloween crafts. And I love this garland by Rawbone Studio not just because it's beautiful, but also because of all the delicious felt textures in and around it. Wonderful! These are adorable! I love them. MUITO LEGAL, MINHA FILHA ADORA ESSAS CAVEIRAS........BOM DIA !!!! Can we buy the pattern? I have to make these too! I love these! We don't really celebrate Halloween here (Australia) so I've been thinking more of Christmas craft but I think I need to make these. I can do a Halloween display in my library. Thanks for sharing! I stitched skulls on my skirt. Love them! Wowie, Thanks everyone for the compliments. I'm Robin of RawBone. There is no pattern, just cut two skull shapes by hand, make two eye holes in one, add a contrasting piece of felt in back of the eye holes and stitch away. Halloween starts in July around here!